Is your favorite sandwich sliced cucumber with Daikon? Do you condition your compacted soil by planting five Daikon plants per square foot? Do you eat Daikon for its health benefits? Do you grow Daikon as a “trap” crop to protect other plants from pests, or as a cover crop in your garden? If you answered no to any or all of these questions, it is time to learn about Raphanus sativus var. longipinnatus, the multi-tasking Daikon radish, also known as white radish. A rosette of green leaves supports a large root…all of which are edible. The carrot-shaped Daikon, with its large, cylindrical, white root is what we are most familiar with in the United States. It weighs from one to two pounds at maturity, has root diameters up to four inches and can be twenty inches long. However, there are round varieties as well, and skin or flesh that is purple, red, pink, green or black. Some Asian varieties are grown for their leaves rather than their root. There are many Asian and heirloom options in seed catalogs. If the seeds are planted in the fall (September through October), the roots will enlarge in the cool months and should be at peak-eating, usable quality when they are less than 12 inches (30 cm) long, or after sixty or seventy days. Perfect growing conditions for these vegetables include raised beds, or soil that is deep, loosely compacted, moist and fortified with compost. These large radishes require a lot of space. They should be planted with that requirement in mind. Many varieties will continue to grow much larger if allowed to stay in the garden (but become woody). If the top is cut, the root will die. Also, very cold weather will cause them to die back and start rotting. Daikon radish is a permaculture or organic gardener’s friend. If planted closely together (five seeds per square foot), the shade of their dense leaves suppresses weed growth. They also can be used as a “trap crop” for flea beetles and other insects that might, otherwise, damage more valuable and vulnerable spring cabbage and lettuce crops. 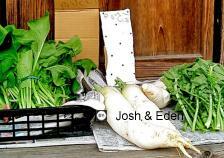 Daikon leaves can be cut and used as green manure. Sometimes referred to as “bio-drills,” Daikon roots are grown to break up compacted soil. The deep, penetrating roots also bring up nutrients from the sub-soil and, if the root is allowed to rot in place, it releases these mined nutrients and deposits organic matter into the topsoil. By allowing surface level nutrients to percolate down the deep root channel, the roots improve water penetration. Whatever their shape or color, Daikon radishes are a great source of fiber and vitamins. If eaten raw or steamed lightly, Daikon leaf greens provide many essential vitamins and nutrients, especially Vitamin C. Unfortunately, mature plant leaves can be too tough to be eaten raw. A two-inch chunk of root contains only about fifteen calories. Daikon can spice up meals. When young and fresh, they are usually mild flavored. Leaves and sprouts have a wide variety of culinary uses, and raw root is found in everything from salads and sandwiches to slaws. If growing Daikon for food, pay attention to the days-to-maturity listed on the seed package: if left in the ground too long, Daikon roots can become woody and bitter. Remove the greens before storing. The harvested roots will keep a few weeks in cool dry environments, and, if the humidity is high enough, a few weeks in a refrigerator. Both Daikon leaves and roots contain a mustard-like oil that makes fresh Daikon spicy and tart, but they are still milder than some smaller, red members of the radish family. If grown as a summer crop, they will be hot. If grown during the fall/winter, they will be mild and juicy. The part of the root nearest the leaves will be sweetest, and the lower section more bitter. Raw Daikon offers the most health benefits, but if you can’t take the heat – go to the kitchen. Cooking tones down the “bite” and the heat; cooked leaves can even substitute for other greens like spinach, kale and chard. In Asia, the roots are popular additions to stews, curries and soups, with a texture similar to turnips. In Japan, where Daikon is produced more than any other vegetable, the root is often pickled, or sometimes shaved and steeped to make tea. So, have you decided? Will you grow Daikon for a trap, a drill, a salad or stew, a cover, a pickle, a compost or just for a healthier you? Can’t decide? Well then, if I may make a suggestion: grow plenty of Daikon radishes every fall.